For many years, artificial neural networks (ANNs) have been studied and used to model information processing systems based on or inspired by biological neural structures. They not only can provide solutions with improved performance when compared with traditional problem-solving methods, but also give a deeper understanding of human cognitive abilities. Among various existing neural network architectures and learning algorithms, Kohonen’s selforganizing map (SOM)  is one of the most popular neural network models. Developed for an associative memory model, it is an unsupervised learning algorithm with a simple structure and computational form, and is motivated by the retina-cortex mapping. Self-organization in general is a fundamental pattern recognition process, in which intrinsic inter- and intra-pattern relationships among the stimuli and responses are learnt without the presence of a potentially biased or subjective external influence. The SOM can provide topologically preserved mapping from input to output spaces. 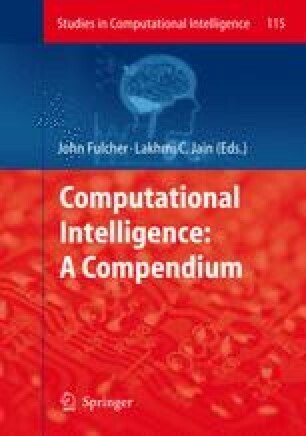 Although the computational form of the SOM is very simple, numerous researchers have already examined the algorithm and many of its problems, nevertheless research in this area goes deeper and deeper — there are still many aspects to be exploited. In this Chapter, we review the background, theories and statistical properties of this important learning model and present recent advances from various pattern recognition aspects through a number of case studies and applications. The SOM is optimal for vector quantization. Its topographical ordering provides the mapping with enhanced fault- and noise-tolerant abilities. It is also applicable to many other applications, such as dimensionality reduction, data visualization, clustering and classification. Various extensions of the SOM have been devised since its introduction to extend the mapping as effective solutions for a wide range of applications. Its connections with other learning paradigms and application aspects are also exploited. The Chapter is intended to serve as an updated, extended tutorial, a review, as well as a reference for advanced topics in the subject.